Award-winning blogger and best-selling cookbook author Ree Drummond brings her signature wit and down-home recipes to an all-new Food Network series. Shot on location at her family’s picturesque Oklahoma ranch, The Pioneer Woman premieres Saturday, August 27th at 11:30AM ET/PT, serving up a slice of frontier life along with the “accidental country girl’s” step-by-step recipes for creating wholesome, hearty family meals and elegant menus for entertaining. Before the on-air premiere, fans will have a chance to get a sneak peek of footage from the premiere episode beginning Monday, August 22th at 9am ET on www.foodnetwork.com/pioneerwoman. 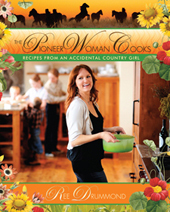 Over the past five years, Drummond has chronicled her life as a city-gal-turned-rancher’s-wife on her phenomenally popular food and lifestyle blog, ‘The Pioneer Woman’. With her new Food Network series, Ree invites viewers home to the range to watch and learn as she flips Lemon Blueberry Pancakes for son Todd’s birthday breakfast, achieves a Perfect Pot Roast for Sunday family dinner, and serves up Fig, Prosciutto and Arugula Pizza and Sangria for ladies night in. In between culinary conquests, Ree takes time to wrangle horses, compete in a shooting contest with her husband Ladd (aka “The Marlboro Man”), have fun with her four adorable kids and try to keep Charlie the basset hound out of trouble. For more information, videos and recipes visit: www.foodnetwork.com/the-pioneer-woman and checkout Ree’s blog at http://thepioneerwoman.com/.